Having emerged as one of the highly compelling verticals of the smart & sustainable technologies industry, mobile wallet market is witnessing unprecedented expansion trends in the recent years. Thanks to the ever-growing technological advancement and digitization trends faring across the electronic devices sector that have connected the world of digital information “on the go” via smartphones and mobile devices. In fact, mobile devices have now become most people’s preferred way to access the Internet and its vast content. As smartphone adoption continues to rise, the trend is significantly compelling top companies to pursue “mobile-first” strategies – prioritizing mobile responsive websites, applications, as well as online payment options. Pertaining to the same, it comes as no surprise that companies in mobile wallet industry have forged a slew of strategic partnerships, M&As, and product differentiation tactics to tap the vast market potential. Another important trend that has immensely influenced the global mobile wallet industry share is the rise of e-commerce platforms. Online retailers are increasingly focusing on deploying strategies that will drive mobile commerce experience that is as seamless and satisfying as possible. Offering payment options which are much more than cash, check, or credit cards, the emergence of mobile commerce is rendering a solid impact on proliferating mobile wallets that offer cardless, cashless, contactless payment options via smartphone & tablets. Industry analysts claim that with the online consumers estimated to exceed 2.5 billion by 2020, the competitive scenario of mobile wallet market is set to be rather intense with core industry players trying to retain their stance. Having already consolidated its presence across this lucrative business vertical, Apple Inc., for instance, is currently expanding its retail merchant network with its mobile wallet application Apple Pay. As per the company statement, Apple Pay will be expanding its network to several U.S. based retailers, convenience store chains, and quick-service restaurants. Adding these names to its bag, Apple Pay is covering mobile wallet options for 65% of all retail locations in the region or brings mobile payment option to 74 of the leading 100 US merchants. Apple’s partnership announcement with Target, recently in January 2019, is certain to scale mobile wallet industry share, given the merger to create convenient and quick pay options for consumers. The tech behemoth is also partnering with other retailers including Speedway convenience stores, Taco Bell, Jack in the Box, and Hy-Vee grocery stores among others. The move is clearly set to expand Apple Pay’s volume with widespread merchant network, in turn driving profitable remuneration portfolio for mobile wallet industry. It is prudent to mention that along with Apple Pay, other major mobile wallet platforms such as Google Pay and Samsung Pay will also be available for the shoppers at every Target store. Meanwhile, Apple Pay is also working with cards from BNP Paribas and HCBC France that will join the list of already 25 card issuers supporting the tech-giant’s mobile wallet service in France. Monese, a company that offers money transfer services just like other banking options, has also recently announced that its cards will now see the international rollout of Apple Pay in seven countries including Italy, Finland, Spain, UK, Germany, France, and Ireland. The instance also validates the fact that banking establishments are set to be the lucrative growth avenues for the expansion of mobile wallet industry in the coming years. Companies operating in the banking sector are further pouring money in developing as well as linking banking transaction platforms to mobile wallets systems. Recently for instance, leading mobile wallet industry player Google is widening its scope in India’s banking sector and has announced its partnerships with private banks such as Federal Bank, HDFC Bank, Kotak Mahindra Bank, and ICICI Bank among others, to facilitate instant loans to Google Pay customers. Furthermore, an international payments provider, JCB, has also teamed up with Idemia, to launch Google’s digital payment platform in Japan. The partnership is set to offer Google Pay mobile wallet users to make contactless mobile payments. With similar investment trends set to materialize in the ensuing years, reports claim the global mobile wallet market size from banks to register a CAGR of 15% over 2018-2024. Other leading names in the global mobile wallet market include PayPal, Samsung, JP Morgan Chase, One97 Communications Limited, PayTM, Visa, First Data, Well Fargo, and Mastercard. Clearly, mobile payment options have emerged as the next big thing in providing seamless transaction, and are probably set to knock out even debit and credit cards in the ensuing years. With contactless & cardless payment becoming more and more common place, the commercialization matrix of the global mobile wallet industry is poised to carve a lucrative growth graph. 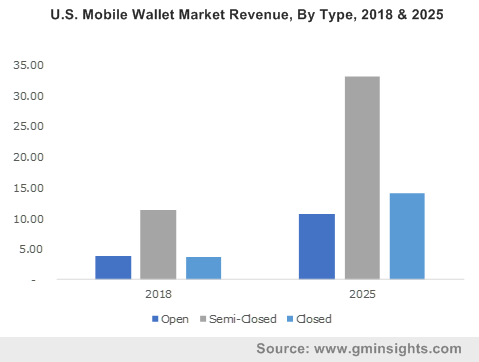 A presumption validating the same is of Global Market Insights, Inc., that claims mobile wallet market to generate more than USD 250 billion by 2024.